I have to admit I’m partially biased towards this ICO. Firstly as a developer we get to find bugs in smart contracts and get bounties for doing it. A massive tick on their model to start off with. I was also a victim of the DAO hack and although we’ve successfully sorted that out with a couple of forks and DDoS to strengthen the Ethereum network. In my heart of hearts the Ethereum contracts needed a proper going over. This is where Quantstamp comes in and I’m super excited for this project. I’m not going to write a full review on Quanstamp as I don’t think I’m qualified to do so and quite a few people have done a very thorough job already. I’m merely going to try to summarise Quantstamp and have attached some very good Quantstamp articles below. In a sentence it’s a decentralised automated upgradeable security auditing platform for smart contracts with a token-based verification and bounty platform. Firstly it’s a protocol token hence scalable to multiple projects and ICOs. They have completed auditing Request Network ICO recently and have an active github page where you can try out their solidity analyser and parser. Secondly I believe massively in this team. They have a multidisciplinary team filled with very experienced security engineers and expert advisors in the blockchain ICO and security space. Also they have a highly passionate CEO who came up with the ingenius proof of care form idea. This is clearly a step away from the conventional ICO world whereby big whales holding thousands of ethers can massively pump and dump ICO coins willingly. Thus enabling cheap presale prices for the common folk like me who can only afford not that many ethers to contribute. Pray you get on the presale. Otherwise wait till mainsale. • Presale Bonus: 20-100% bonus for the presale participants. I have to say I have not been so excited about an ICO for a long time. This is by far the best ICO of 2017.
https://steemit.com/ico/@talaxy/quantstamp-proof-of-care-poetry :) do it likewise if you wish ! Wow @kevteh it's really awesome project I'm listened about from my friend but I don't take it if seriously after read your I'm excited to joined this project. But I had confusion with eletroneum & Qunatstamp? What you think which one is best! 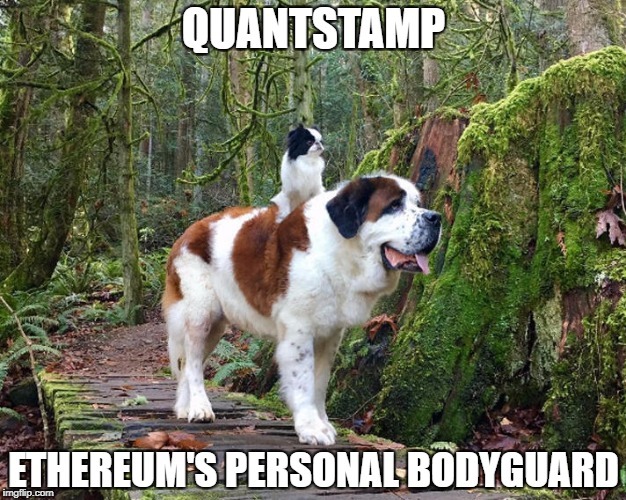 I personally think quantstamp has more potential as it can be built into multiple new eth based protocols or even existing ones. Not sure mobile mining is the future. Electroneum did say your mobile will not be harmed or cause heating in any way but I highly doubt it..Just my opinion. @alchemage has voted on behalf of @minnowpond. If you would like to recieve upvotes from minnowponds team on all your posts, simply FOLLOW @minnowpond.